If a tree falls in the forest and no one is around to hear it, does it make a sound? That’s one of the questions we had to discuss in college - Philosophy 101. Likewise, if an artist paints and no one is around to admire his (or her) artwork, is it still beautiful? Or on a more basic level, how will the artist eat? In art, the gallery owner is a vital link. 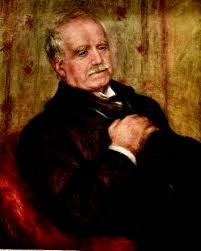 And for Impressionism, that gallery owner was Paul Durand-Ruel. He was born into the art world, taking over the family business in Paris. But during the Franco-Prussian War he had to flee to London, where he met up with a group of French painters who were also in exile. They included Daubigny, Monet and Pissarro. Which is why his first Impressionist show was held in London in 1872 ... and he never looked back after that. Although he returned to Paris once it was again safe, his genius for promoting the school of art he loved so much was to perceive that its success would lie across the Atlantic among American art lovers, who not only admired the artworks but bought them. It also saved him from bankruptcy. He opened a gallery in New York, which his two sons ran alternately in six-month stints. Many of today’s Impressionist collections in the major American museums passed through the hands of Durand-Ruel. As the Musée du Luxembourg is a tight fit, I let the week-end go by before sallying out. Unfortunately, I forget some people are taking a long week-end. (Tuesday is Nov. 11, the end of World War I. Big deal here in Europe.) “Usually,” the ticket seller tells me, “Monday is calm, but...” Then he waves his arm at the milling crowd. The first room is always the most crowded. People are anxious to see it all. Moving slowly, listening to their audioguide. What’s more, the first room also has the smaller documents, so there’s more to peruse. With the lighting low, documents are hard to read, so I skim over that part. There’s enough to see on the walls. First off is Renoir, and his portraits of the Durand-Ruel family: the elderly Paul on the left as you enter, the young sons along the other wall. The most interesting thing for me in this first room were the doors to the Durand-Ruels’ living room... painted by Monet. In each of the panels is a floral motif: vases with tall flowers in the long top panels, branches of lemons and oranges on the lesser bottom panels, and close-ups of flowers on the small horizontal ones in the middle. The following room gives an idea of the pre-Impressionist art world. Delacroix, Corot, a piece with pumpkins by Courbet that’s just right for this Hallowe’en-Thanksgiving season, Millet’s The Sheep Fold that sold for more than any other painting of its time... Works by all of these artists were revealed to the public by Paul Durand-Ruel. But when his path crossed that of the Impressionists, the art dealer’s had an epiphany. Impressionism was to become his specialty, as demonstrated in the rest of the museum, a series of interlocking rooms just chock-a-block with masterpieces. There are a few portraits by Manet and also a historic painting of a sea battle off Cherbourg where a Yankee ship sinks a gun-running Confederate ship; all part of the blockade but happening far from American shores. I find Manet the most classical of the Impressionists and he’s not one of my favorites. Degas, on the other hand is and there are a few by him - horse racing scenes and ballet of course, the artist’s two favorite subjects... plus a surprising Mademoiselle Lala au cirque Fernando, much larger than his other works. The lighting on Mlle. 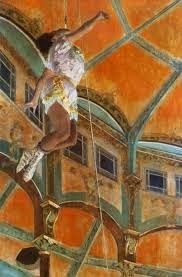 Lala hanging from a rope by her teeth is amazingly luminescent, as befits a circus. There’s a waterscape by Boudin, the father of Impressionism and mentor to the young Monet. Sisley is here - landscapes with his ever-present water leitmotiv. Cézanne as well, easing us out of Impressionism and into something new, his Le Moulin sur la Couleuvre vers Pontoise looking almost Cubist. The ladies are also represented. There are two paintings by Berthe Morisot: a landscape from Washington’s National Gallery of Art and, from the Art Institute of Chicago, the diaphanous Femme à sa toilette, all mirrors, soft fabrics and gentle light. (The lady may be getting ready to go out, but somehow I feel she’s just come home after a long night at the Opéra, something about the tired pose of her hand getting ready to let down her hair.) There are even two canvases by the American Mary Cassatt: a portrait of Durand-Ruel’s daughter from a private collection and The Child’s Bath, again from the Art Institute of Chicago, an intimate moment between mother and child, so sharply detailed it looks like an etching in color. But Pissarro - Durand-Ruet’s first Impressionist purchase - and Renoir and Monet were clearly his favorites and are most represented here. I admit I’m not a big fan of Renoir; I find his women are far too pink. But seeing three of his dancing couples side by side by side is quite striking. They’re placed just before the exit, on a wall all to themselves, for maximum effect. All three were painted the same year: 1883. Two come from the Musée d’Orsay but the third - Danse à Bougival - is on loan from Boston’s Museum of Fine Arts. In it, Suzanne Valadon dances with a bearded gentleman in a straw hat. It’s also Suzanne Valadon who posed for Danse à la campagne, but the bearded man here is much darker and more elegantly dressed. Valadon lived right around the corner from my atelier-apartment in Montmartre, so I enjoy discovering the face of her youth. She would have been only 18 in these paintings, and already an artist in her own right, but not yet the mother of Maurice Utrillo. The Monets were the most interesting. Renoir pretty much always remained Renoir, a type-casting of the artist world. But Monet morphed, especially in his Varengeville works. In Eglise de Varengeville his style looks a bit like Van Gogh, the cliffs rendered in thick, slashing strokes, the clouds fluffy blurs. Yet nearby his Pointe de douaniers, Varengeville is somewhat pointilliste. Two entirely different styles. As with Renoir’s dancers, the museum has juxtaposed three poplar canvases by Monet, one from the Musée d’Orsay in Paris, the second from London’s Tate Gallery and the last from Philadelphia’s Museum of Art. It’s wonderful to see them reunited here. 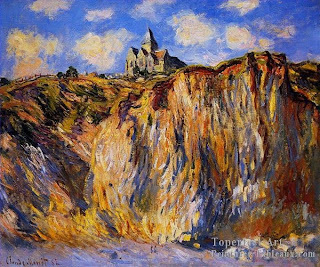 If I had to pick a favorite of the 80 canvases, it would have to be Sisley’s Vue de Saint-Mammès, on loan from Pittsburgh’s Carnegie Museum of Art. All the different lighting effects - in the sky, in the water - the houses and their reflections so strikingly rendered - the opposition in texture between the reeds and the water they grow out of... It’s just perfection. In order to pull off a show of this kind, there must have been a lot of correspondence flitting back and forth between the leading museums of the world: London, Berlin, Washington, Philadelphia, Chicago, Cleveland, Pittsburgh, St. Louis, not to mention the private collections. I wonder how many years this was in the making! As I said, the Musée du Luxembourg museum is small and can be very crowded, although they try to limit the number of visitors inside at any one time. So it’s better to go on an “off-day” rather than the week-end. And perhaps book an entrance time beforehand, on-line. But this is an exhibit not to be missed if you are a lover of Impressionism. And if you feel you’ve been especially good and patient, you might want to reward yourself with a pastry at the shop just outside the entrance. It’s the annex of the famous Angelina’s on the rue de Rivoli across from the Tuileries Garden. Paris has the Musée d’Orsay. Now Brussels has the Musée Fin de Siècle. With my train arriving from Leuven hours before my lunch with a friend, I had time to spare. And uphill from the Central Station lies a whole complex of museums, the Royal Museums of the Fine Arts of Belgium. As part of the “redeployment” of their collections, they had the excellent idea of creating a museum for René Magritte in June of 2009. Then only a year and a half ago they created a “turn of the century” museum. And it covers the artistic period dear to my heart: the Impressionist years. Whether this decision was to attract some of the funds that flow from the swarms of art lovers who flood the Musée d’Orsay in Paris, or whether it was just the brainchild of the curator, it was brilliant. I decided to give it a peek... and surfaced (literally) well over two hours later. You enter at ground level, “ground” being at the top of the hill overlooking the old sector of Brussels. And it’s all downhill from there. Again, literally. After you buy your ticket, you pass through a majestic hall, which reminded me of the Detroit Institute of Arts hall, minus Diego Rivera’s frescos. On one side stands a marble statue of a very shapely naked man with a sword. Across from him, a painting of a class full of young girls in white frocks and bonnets who, at that time, had probably never even seen their father with his shirt off. It’s an interesting juxtaposition. Then you go down a level, where you’re obligated to leave your goodies in a locker. Ladies, be warned that even my oversized purse was persona non grata, although I saw no artwork in the museum actually small enough to fit in it, should I have decided to try to steal it. They do allow cameras though, and the taking of photos (without flash) which isn’t the case for all museums any more especially those with well-stocked museum shops. After that you go down another level, and that’s where the art trip through time begins. Generally speaking, the art is displayed in chronological order. The lower the floor, the deeper into Impressionism you are. On the first level down is an oil-on-wood masterpiece by Henri Leys called Churchgoers. His sketch of a nattily-dressed couple headed off to church on a Sunday morning is rich in color, in spite of being incomplete. It marks the start of the transition into Realism by this Romantically-trained Belgian artist. The next painting that caught my fancy was a jump back slightly in time, to John Constable and his Sky Study: Brighton Beach. Here were the very beginnings of what would become Impressionism by the time Guillaume Vogels painted his oil canvas of Ixelles, Rainy Morning just a few feet farther down the wall. The “impression” of rain and gloom made you want to turn your collar up and open your umbrella. And then the clouds part and the blue skies come out and I was walking along the banks of the Lys River with Emile Claus almost at the turn of the century. In Trees Beside the Lys, the rosy sun - whether at dawn or dusk - lights up row upon row of tall trees, the whole picture reflected in water the same color as the sky. It was all quite misty and ethereal. would come later with Fauvism, long after Evenepoel died at only 27. At the very lowest level (-8! 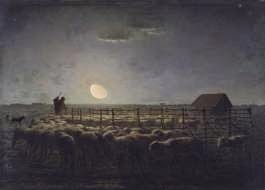 ), there were the most recent paintings in the collection. One was a group of strange faces by Emile Fabry. Most of the women are staring at something one of them is holding; it looks like colorful flowers. Others are staring straight out of the painting, at us, the viewers. All of them show no emotion at all, which I found strange in view of the title - The Offering - but perhaps that’s normal for Symbolism. Another Symbolist painting nearby was of a different style: something like a cross between Gauguin for the background scene and Puvis de Chavannes (of Paris Panthéon fresco fame) for the hallucinatory Virgin with Child in the foreground. It was painted by Gustave van die Woestyne and is called Sunday Afternoon for some reason - although that might explain the Virgin - and the farmers are not working but just admiring their pigs. In spite of the flatness of the image, perspective is indicated by the size of objects and by the spacing of the lines of the hedge and also the fence. It was quite fascinating. That final level also has a collection of furniture and house decorations that would make a fan of Art Nouveau swoon. A fireplace facade by Jean-Désiré Müller, a desk by Joseph Boverle... and the fantastic Gillion Crowet Collection with bronzes by Mucha, silverware by Follot, glass by Gallé and much more. It just goes on and on. A feast for the eyes. And provides a three-dimensional break from the two dimensions of all those photographs and paintings. In talking with one of the guards at the end of my visit, I learned that there is yet another level to this museum, but one not open to the public. On that final level he said there was a grating under which you could see and hear a river flowing below. In other words, you - and the museum - have traveled down through the entire hill, to its base and the underground stream that probably empties into the city's only river, the Zenne (unless it's already part of it), or into the Charlevoix Canal. Given how many levels there are, you’ll be happy to know that there’s an elevator you can take back up to the exit-and-shop level at the end of your visit... and it even has seats in it. It appears there’s also a café and a brasserie, but I didn’t see either. Of course I’d spent far more time than I’d planned admiring the art collection and I was running late so I really didn’t look very hard. They’re probably near the gift shop. This museum has a lot to offer, so plan enough time to enjoy it fully. It’s roomy and quiet. And the lighting is remarkable, which is a good thing because the darkness in these bowels of the earth could make the atmosphere feel almost claustrophobic at times. You would be doing yourself a great service to visit the Brussels sister of the Orsay Museum in Paris. Belgian artists often seem to be the poor cousins in the art world. So even if you think you know all about Impressionism, you’ll find artists here you perhaps didn’t know. Once again it’s the Season of the Pumpkin: Hallowe’en and Thanksgiving. This recipe comes from Auvergne, a region in the Massif Central where volcanos - now extinct - once towered above the primal waters that covered most of the Earth. It is a handsome land in the summer, covered with vegetation made lush by the ancient lava flows, a land where russet cows graze freely. But in winter, with temperatures often the lowest in all of France, it becomes a hard place to scratch out a living, yet still strikingly beautiful with its robust houses of dark basalt walls and lauze stone roofs standing out against the snow. It is traditionally a poor region, where people survived on lentils, cabbage, chestnuts and pumpkin. Chef Roland Durand grew up on a farm in the Auvergne, one of seven children, and learned to cook with his mother. Which may be why he loves these simple country recipes, the recettes de terroir. Accompany with a hearty red, such as a cahors.